The 10 Best Brunch Spots in Kentucky! Brunch is the place where breakfast and lunch meet. 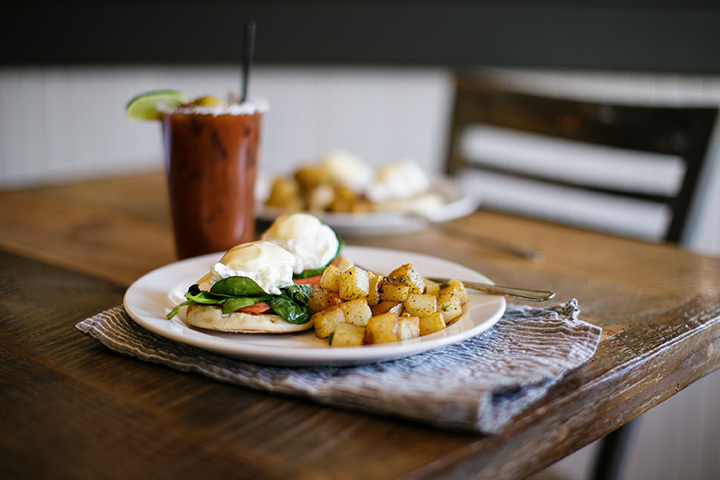 If you enjoy the weekends and want something a little different than the fare you eat during the week, slip down to one of the best brunch places listed below and give your taste buds a treat. Brunch offers the change to try something new or combine all your favorites. Either way, make the weekend extra special and take yourself or your family out. What do you get when you combine a foodie and a self-starter with the dream of creating a local restaurant? In Lexington, Kentucky, you get the Lexington Diner! Recently featured on several national TV shows, the diner has received rave reviews on social media and by word of mouth. Great Southern food with a slight twist to make it interesting and the desire to have a “Yes, we can” attitude are the trademarks of this friendly eatery. Open every day, they offer great breakfast, lunch, and dinner options like their very popular fish and chips, Kentucky bourbon burger, smoked gouda omelet, Turtle Cheesecake French toast, and much more! If you can’t decide between breakfast and lunch, stop by on the weekend for their brunch featuring options from both menus. Fried green tomatoes have earned Otto’s a place as a culinary favorite, and foodies will love the sophisticated but comfortable environment. Since 2003, those living locally and others traveling the distance have enjoyed the best of what the South has to offer, like Kentucky Hot Brown, a baked delight featuring sourdough bread with ham, turkey, and cheddar cheese topped with a creamy béchamel sauce, bacon, and fried green tomatoes, shrimp and grits, crab hash, and tomato pie filled with fresh basil, green onions, and tomatoes and baked with a cheese blend designed by the house to make your mouth happy. When you do it right, there’s no need to improve. That’s the perk of being a time-honored, tried-and-true restaurant. Giuseppe’s Ristorante Italiano, a hidden gem in Lexington, Kentucky, takes everyone who eats there by surprise with the quality and relaxed environment that’s made it a popular spot. Dine in the main dining room or on the patio. If you’re there during the week when they have live jazz, you can enjoy your meal in the lounge. Sunday brunch is a special time and offers a chance to try a little bit of everything like beef tenderloin or crab cakes and Eggs Benedict, the spinach, bacon and cheddar frittata, or grilled yellow fin tuna. There’s a special children’s menu with favorites for younger diners. What started out as a place to feed hungry community residents during the Great Depression, Colonial Cottage has been the mainstay of keeping that mission alive for over 80 years. Known as the diner with the best omelets and cream pies, this Erlanger, Kentucky, restaurant offers breakfast all day every day. Voted “Best Fried Chicken” by Northern Kentucky Magazine, that’s only one of many awards and recognitions received, including being featured on “Taste of America.” Stop by for brunch on Sunday and enjoy breakfast and lunch favorites. If you’re looking for a comfortable, casual retreat from everyday routines, Buckhead Mountain Grill is just the place. Located in Bellevue, Kentucky, you’ll wonder if you’re eating in a restaurant or slipped to another dimension where life and food was simpler and quieter. For more than 20 years, hungry diners have been enjoying signature dishes like meat loaf and pot pies that stir memories of home. With a nice selection of beer, you’ll have no trouble finding an old favorite or making a new one. Opting for a different approach to food and the overall dining experience, the owners of North End Café in Louisville, Kentucky have hit the mark over and over again. When the restaurant opened in 2003, it quickly became a favorite, and by 2012, additional services and menu items were added at customer’s requests, and another location was added. Today, the café is known as a leading establishment for traditional American foods with a healthy twist. Homemade, fresh, and with attention to dietary requests for vegetarian, vegan, gluten-free, and organic options, North End Café is a premier restaurant. Brunch is available at select times, so call ahead or check the website for details and times. What could be a better combination than a local microbrewery and a place that serves great pub grub? White Squirrel Brewery, located in Bowling Green, Kentucky, is just that. With a food and beer menu that is guaranteed to satisfy, people are talking spreading the news about the great services, great food, and great atmosphere. As if the normal weekday menu wasn’t good enough, the brunch menu on weekends is fabulous. Whether you’re local to the area or passing through, a visit to sample mouthwatering dishes like the citrus Cajun French toast, breakfast tacos, or chicken and biscuits is worth the drive. Great food, great prices, and large portions is what you’ll find at the Gold Rush Café in Paducah, Kentucky. Come in with your appetite and leave contented at this awesome place for brunch. It’s so hard to get great hollandaise sauce, but this place gets it right every time. And if you’ve never tried a Scotch egg, you have to sample this sausage wrapped deep fried egg for a taste treat! If you only come in to sample the biscuits and gravy, it’s worth the trip, but you’ll want more. Do yourself a favor and make the trip. Serving Southern-inspired cuisine with a flair, The Miller House is a family-owned restaurant located in Owensboro, Kentucky tucked inside a gorgeous 1905 home. What makes this place even better is that they grow their own vegetables and what they can’t produce, they get from local farmers and sources to round out a healthy and delicious menu. Recipient of many awards like the prestigious “Best Food Finds in Kentucky” award and several for being in the top “Best Whiskey” and “Best Bourbon” bars in the country, The Miller House compliments their great food with live music events and a Sunday Brunch menu that features fried green tomatoes, house specialty salads, sandwiches, and entrees like bourbon barbecue chicken and fried catfish, and daily-made desserts. Don’t let the outside and small size fool you. This little Mexican restaurant is taking Louisville by storm with their authentic and tasty breakfast and lunch foods. Open every day, Con Huevos uses fresh ingredients to make flavorful combinations that will keep you coming back for more. You’ll enter a guest and leave like family. This is good food at a good price.